Whether it's for getting patched up after a fight, dealing with a debilitating disease contracted in a fetid dungeon, or negating the effects of a terrible poison in the middle of combat, eventually every adventurer needs a healer. Most healers have their own agendas, though, and these don't always end at mending their allies' ailments. 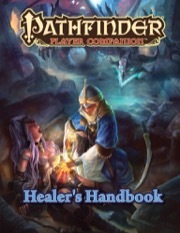 With Pathfinder Player Companion: Healer's Handbook, characters can learn to efficiently heal their patients—without finding themselves reduced to being walking first-aid kits. Healing-focused archetypes for 10 classes, such as the angelfire apostle cleric and invigorator paladin—plus options for arcane healers, such as the faith singer bard and arcane physician wizard. Feats geared toward characters who like to heal on their own terms, plus feats that allow any adventurer to harness her own vigor in the heat of battle. A host of new options to customize features for classes that dabble in healing, including focused blessings for warpriests, new paladin mercies, druidic herbalism, and a shaman spirit specialization. New basic options for classes? Sold! Book gets five stars for some really neat stuff design-wise. It expands the basic options for some classes- no archetype compatibility issues, no extra features you don't care about or trading out stuff you wanted. If you play a Druid or a Paladin, you now have additional options on your list. I'd love to see more of this in future books! If you're a Druid, you can get an alchemist-esque potion-making ability for Nature's Bond. There are some balance issues on the money part of it, so I recommend GMs go with "you can stockpile, but not sell". Could be a good idea to rule that expensive material components still cost money, too. If you're a Paladin, you can choose from three new bond choices instead of a weapon bond or mount. More healing, a communal ward against evil, or being one terrifying avatar of divine justice. In addition, there are a bunch of new choices for mercies ranging from things that are great for a character arc to cementing your position as the last thing an evil wizard wants to run into. Another really neat design choice that I'd love to see more is explicitly compatible archetypes- the Alchemist's healing archetype is designed to work with Chirurgeon, addressing overlapping features. Having two compatible archetypes with similar goals is great for character customization- you now have three levels of healing archetype to apply (one, the other, or both). Also solves the big issue with Chirurgeon while it's at it! Both Alchemist archetypes are pretty awesome, and do a great job of expanding character options with good balance. Clerics get an archetype that doesn't mess with their domains. Whoo! Warpriests and Shamans get subblessings and subspirits. -There's really only one good thing for the heal skill, an inexpensive magic item to expand its effectiveness. Nonmagical healing in the book is not very impressive otherwise. - If you wanted more healing on non-healing classes, this isn't the book for you. It's a book about making the existing healers better at their job or giving them more options while they do it. - Sorry, evil Clerics. You're still preparing healing spells in slots like before. You can now use them for torture or manipulation, though, so those spells will be more versatile. All in all, a great win for character versatility! This book is all about healing, as you probably guessed. But how does it provide more healing options? Mainly Archetypes. Just over a dozen. Most are meh, a few are bad, and a few are good. There are also some Feats. An interesting Feat chain is now available for characters with a 13+ CON, that lets them "rest" as a standard action to re-gain HP. Outside of Archetypes and Feats, there are a few Traits and Magic Items and Spells that offer a bit here and there, but nothing too earth shattering from what I saw. Overall I think this is a good book. Not quite 5 stars, and a bit on the bland side, but good. A book on healing is going to be a very daunting task, so it's hard to judge too harshly here. I'm not terribly impressed with this book, but I'm not angry I purchased it either. In general, I found the majority of the Archetypes very lacking, especially the Angelfire Apostle I was most excited about. I'm also a bit disappointed that the book starts out describing how the ability to heal (including removing conditions and raising the dead) is the most miraculous and wondrous feat of all magic, but then the book basically goes out of it's way to hand it out like candy. I'm of the opinion that there is already too much available, cheap healing as is, and it's detrimental to the game, so adding even more, and basically stomping even more over the line of one of the defining traits of divine magic (vs Arcane, Occult, and Martial abilities) was a really poor call. Again, just my opinion. It lacked much in the way of non-magical applications (or expansions) for the Heal Skill, or even much in the way of talking about healing equipment or goods. Unfortunately, I just found most the material bland and/or mediocre. On one hand, I love just how much crunch they put in this book, and am honestly surprised with how much they touched on so much variety, (a trait for this deity, an option for that one), I didn't really expect to see. I also like some of the spells the book offers, but at the same time, I really wish they where a few Spell Levels lower so that they might actually be used in play. Or at least had lesser versions. I think there was just far too much split focus for this product to really have been that effective. No real Channel Energy or Lay On Hands options, and as I mentioned, nothing really for the Heal Skill. There is a bit for Occult stuff, but even being not a fan it looked kind of lackluster. 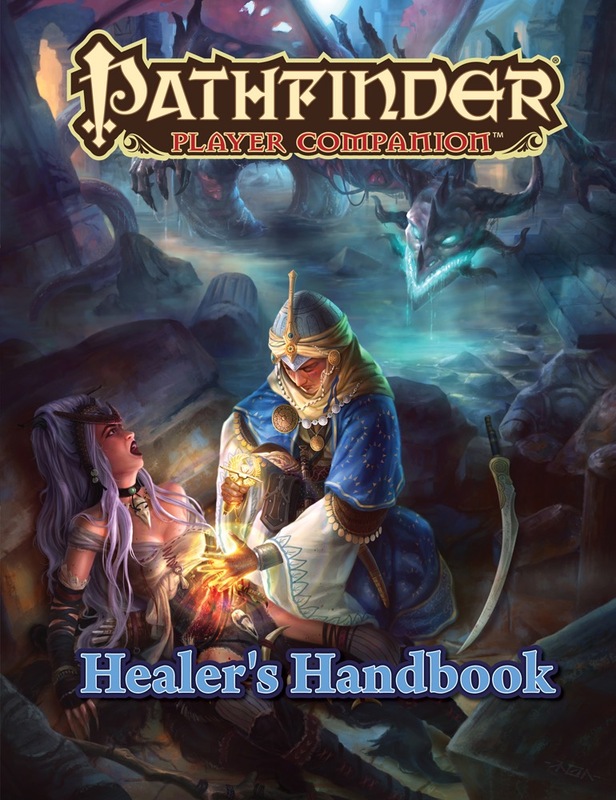 For the most part, this book doesn't really make Being the Healer Fun as it offers a few different ways to do so, without really helping to much to do it well or that interestingly. Some interesting options for healing and curative related spells, powers, etc. -New kineticist wild talents, oracle mystery, witch hexes and patron, paladin divine bonds and mercies, bardic masterpieces, alchemist discoveries, warpriest blessings, and druid nature bond. -New feats that allow you to heal yourself. -No new channeling, lay on hands, or healing enhancing feats. -No healing focused archetypes for non-casters(except one monk and one ranger). This book's kind of hard to get a perfect read on because it's so densely packed, but what I've been picking through seems average. There's a few interesting options such as the Angelfire Apostle that effectively adds a breath weapon to healing spells and the spell Balance of Suffering which allows you to heal one target at the expense of another's life force, or the Phoenix Feather which is just a Phoenix Down, or the Paladin stuff which is all pretty great. But a lot of the stuff just seems very bland at best. The Arcane Physician for example is probably the most "meh" thing in the book, since it's just a Wizard that gets healing spells. That's really about it. There's also a weirdly high amount of options dedicated to status suppression and miscellaneous support abilities instead of actual healing, such as the Sacred Attendant who gains the ability to boost Charisma checks. Also, most of the options in the book are caster-oriented. There are two non-caster archetypes (a lesser but unchained-friendly version of Monk of the Healing Hand and a Ranger that's okay at finding plants), and the Combat Vigor feats are more work than they're worth unless you're a Fighter with plenty of feats to spare to make them worthwhile, not to mention they're self-only unlike a wand of a cure spell. tl;dr, if you're expecting new uses for the Heal skill or new alchemical healing items, or feats and abilities that make even the least magically-inclined Barbarian into a somewhat viable out-of-combat healer, this isn't the book for you. If you're looking for new ways for your existing healer to heal more differently, then pick this up. Announced! Cover image and description are not final. Still, I'm glad this is being addressed at last. Of all the mechanics in the game, relegating clerics and oracles to healing only is very limiting for such versatile classes. Maybe we will get more healing related abilities, archetypes, feats, etc. for non-spell casters like the kineticist. I'm kinda curious to see if we'll get the option for an oracle's or shaman's life ink to increase. People keep complaining that 5 per person is too small at high levels, and I'm tempted to agree. Definitely picking this one up when it comes out. Hmm... could be good if it addresses options for nontraditional healing classes as well as the normal ones. This will sound odd, but I hope we get something for evil healers. Why must they always be good? Bad guys need healing, too. Yesssssss! I typically play Bard, but they are Healers too! Any chance this will expand options for the Heal Skill? Yet again another month I will continue my subscription to the best of the Paizo production line (at least my household thinks so). How about a spell that can regrow limbs that comes online before I have the power to bring someone back from the dead from a pile of ash in a completely reformed body? Empathic healing would be interesting, taking another's affliction/wounds and then making a save as if you were the original target to reduce or negate the effect would be cool. I hope we get more options for divorcing healing from divine. More options for evil healer/support roles and some support for the White Mage Arcanist would be welcome additions. Healing based archetypes for wizard, monk, vigilante, mesmerist, alchemist, investigator, etc. A positive energy based sorcerer bloodline. A positive energy based kineticist element. A healing themed psychic discipline. White mage support would be awesome. I'm playing one right now. However, it might come to late for my character. I am curious to see more healing themed spells and magic items. Yeah I'd like to see a few more options for White Mage arcanist myself too. Interesting, I wonder if they update the 3.5 feat that allowed a person to add their level or something to their healing spell.It has been a while since I have looked at Complete Divine. On the subject of White Mage, what I would *most* like to see is a way to pick up Channel Energy dice. Right now the only way I can think of to do it is a level of Wildblooded Sorceror, then either Bloodline Development or Eldritch Heritage Empyreal, which is clunky and inelegant. I'd honestly like to see a mechanic similar to lay on hands with mercies. Playing the white mage in our party, I'm always looking for reliable ways to fix status ailments. I would love for more classes to get lay on hands(with mercies) and channel. Eh. We'll see but if they gave White Mage lay on hands, I wouldn't be against it. Hmm, interesting...mercies are a class feature that I've not yet seen any archetype, feat or talent open up to any other classes than paladin yet. Yeah, I could get onboard with that. Powered by reservoir rather than spell slots, I would suggest. I the chirurgeon archetype of Kineticist lets them take mercies. I think this might be another book where my expectations are getting a little to high and/or my imagination is just running wild. I would like something similar to Close Wounds from the Spell Compendium. Immediate, close range. Less efficient but great for emergencies. There's the Merciful Healer Cleric, and both Antipaladins and Psychics can get self-only mercies (archetype and discipline respectively). But "healing with studs removal" is largely untapped, yeah. A swift action minor healing spell would be awesome. Also some sift action curative spells and spell that is a swift action lesser restoration would be cool. Dunno if we need more crunch if the mindset of a lot of players still rest upon the equation cleric == healbot. If the presented mechanics help remedy this misconception the book is more than welcome. I really hope the people working on this can pull this off. I've always loved the idea of playing a healer but up to now most options that heal hit points have been kind of crap with only a few exceptions. If they can make other classes like Alchemists and Druids good at healing I'll be even happier! Some feats that grant minor healing magic would be awesome. I'd love to see more self-healing options for atheist/agnostic PC's. So far, the Rahadoum style stuff has been underwhelming. So does the Pain discipline of the Psychic, but self use only. Huh, so that's what you look like when you shave. I'm pretty sure that's the point Myth. Now with white mage, there's the fact since you're burning a different form of magic (almost primal one might say), it's different enough to help with healing in some instances. Adding in lay on hands for burning arcane reservoir, you might get a decent healer and a more than passing spell blaster together. What I'd like to see: some kind of blast heal. In WoW I loved to play Discipline priest and heal/shield everyone by blasting monsters in the face. Yeah, you can kinda already do it with Channel Ray, but given the range and the unchanged number of channel dice, unless you're trying to heal just one guy out of a number or sneak attack undead it's a little underwhelming. Something like Heavenly Fire from the Celestial/Empyreal Bloodline would be kinda cool (or, again, a way to get Empyreal as a White Mage without dipping a level of Wildblooded Sorceror would be my choice). All I know is lay on hands + arcanist = more fun for white mages. If so, then that is excellent. I'm also holding out hope for self-healing options for martial characters. I have no idea how that would be done, and doubt it will be covered, but I can only hope!